In a large skillet, melt butter over medium-high heat. Toss shrimp and taco seasoning into the hot skillet. Cook for 1-2 minutes, just until the shrimp is slightly browned. 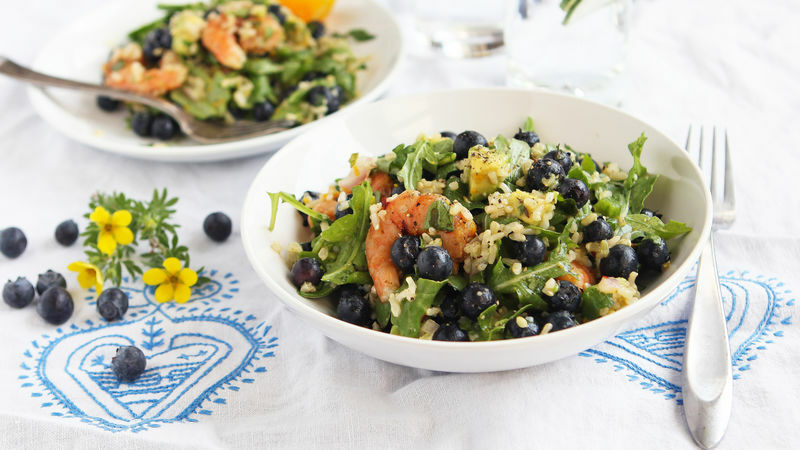 In a large bowl, toss together brown rice, blueberries, arugula, mint, cilantro, and avocado. In a small bowl, whisk together sesame oil, olive oil, orange juice and zest, vinegar, sugar, and red pepper flakes and jalapeno. Salt to taste. Drizzle over salad. Tired of the same old salad? It's so easy to get into a rut, tossing a few basics in the same old bowl, drizzling the same old salad dressing. Why settle for the same old? It's time to AMP IT UP. Toss out that old tossed salad, and toss some blueberries into this vibrant, surprising combination of flavors. So scrumptious, you're sure to love it! Start with a few colorful fixins: Fresh blueberries, bright green arugula, and zesty jalapenos. This salad is simple. And perfect. And simply perfect. Also, it's like nothing you've ever tasted before. A fusion of Mexican and Asian flavors. Mexiasian. It's a thing. Eat it! Whisk together a happy little dressing with jalapeno, sesame oil, and oranges. Drizzle it all over this crazy fab mix of brown rice, blueberries, arugula, mint, and cilantro. Then serve it on a giant dish, grab a giant fork, and shovel it into your face. Enjoy. Eat blueberries. Embrace fresh!